A long time ago, in a galaxy far, far away…ok, a couple of hours ago, the Washington Capitals defeated the Vancouver Canucks, 3-0, on “Star Wars Night” at Verizon Center. There was a lot of skating, not much scoring, and little (if any) in the way of physical play. But the Caps did enough to subdue the Canucks for their fourth straight win. Alex Ovechkin started the scoring mid-way through the first period when, on a power play, he took a pass from John Carlson, cradled it in the curve of his stick, and rifled a shot past goalie Jacob Markstrom on the short side at the 13:46 mark. The Caps could not expand on that lead through the rest of the first period and the entirety of the second period, but Justin Williams got the Caps some insurance in the final frame. It started with Williams scooping up a loose puck along the left wing wall in the Vancouver end and chipping it to Dmitry Orlov at the left point. Orlov fired a shot that Markstrom blockered away to his right where Ovechkin picked it up. Ovechkin centered the puck to Evgeny Kuznetsov, who one-timed a pass back to the weak side where Williams was closing toward the net. From low in the left wing circle, Williams snapped a shot high over Markstrom’s blocker, and it was 2-0, 5:06 into the period. That would be all for the competitive portion of the contest, Tom Wilson getting an empty net goal with 51.1 seconds left to give the Caps their final 3-0 margin. “Now, witness the power of this fully operational battle station.” The Ovechkin power play goal was the Caps’ fifth power play goal in five games, over which they are 5-for-18 (27.8 percent). It extends a productive run in which the Caps are 10-for-46 over their last 12 games (21.7 percent), eight of those games featuring power play goals. “Hmm! Adventure. Hmmpf! Excitement. 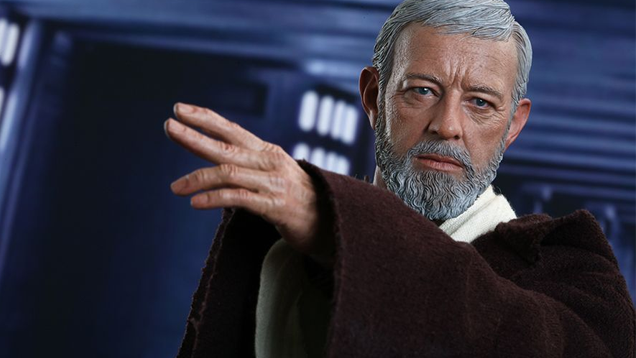 A Jedi craves not these things.” Well, maybe not too much adventure. This was Vancouver’s third game in four days and the fourth game in a five-game road trip. It was a team that might have been ripe for the taking, but the game devolved into a tepid affair that suited the Canucks more than it did the Caps. Give credit to the Caps for not succumbing to that situation. “It’s not impossible. I used to bullseye womp rats in my T-16 back home, they’re not much bigger than two meters.” Good for Tom Wilson getting the empty netter at the end. It was a nice reward for a solid game killing penalties. It is a part of his game that has developed remarkably over the last season, far more than one might have envisioned for him. “Stay on target…STAY ON TARGET…” The Caps had 29 shots on goal, 29 shots attempts that did not make it to the net (15 blocked, 14 misses). Vancouver had 20 shots on goal, 21 that did not make it to the net (10 blocked, 11 misses). “I find your lack of faith…disturbing.” A week ago, the Caps were nursing the wounds of a three-game losing streak, and there were grumblings in Capitals Nation. With this win, they are on a four-game winning streak, their third streak of three wins or more this season. “Traveling through hyperspace ain’t like dustin’ crops, boy!” Jakub Vrana had a couple of excellent chances to add to his goal total after scoring his first NHL in his last outing. He was unable to connect, but his four shots on goal and seven attempts brought to mind visions of a young sniper like Peter Bondra of 25 years ago. "Master Kenobi, you disappoint me. Yoda holds you in such high esteem. Surely you can do better!” Lars Eller… 1-for-11 in the faceoff circle. Tough night. “Do. Or do not. There is no try.” Five shorthanded situations, 10 minutes of shorthanded ice time, one shot allowed, and that one came on the last power play. The Caps held the Canucks without a shot on goal over their first 9:23 of shorthanded ice time. “Somebody has to save our skins.” After a four-game slump in which he allowed at least three goals in each game, goalie Braden Holtby is 3-0-1, 1.45, .950 over his last four games after the 20-save shutout over the Canucks. It was his 25th career shutout. He is one of ten goalies with 25 or more shutouts since the 2010-2011 season, Holtby’s first. “Remember: Your focus determines your reality.” The Caps did dominate the 5-on-5 possession numbers, recording 41 total shot attempts to 30 for the Canucks (57.75 percent Corsi-for; numbers from Corsica.hockey). “The force is strong with this one...” For one night, anyway, the Caps were a team that were in control of the game throughout, especially on defense, where they seemed not to anticipate as much as know what the Canucks were trying to do (letting the Force flo-o-o-ow through them, as Yoda might say...getting tired of the Srar Wars references?). In that respect they did take advantage of the Canucks having played three games in four nights, not making the big, galactically stupid mistake that would give the opponent life and let them back in the game. If the offense isn’t blowing up opponents like the Death Star blowing up Alderaan, then the defense was frustrating the Canucks like a tribe of Ewoks frustrating a brigade of Imperial Stormtroopers. And that is a formula for the Rebels celebrating a victory over the Empire. 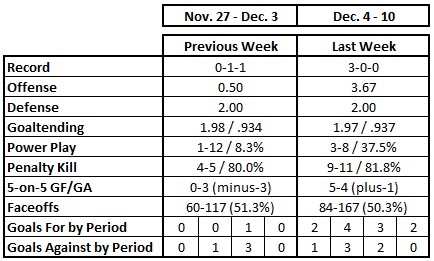 After a disappointing Week 8, the Washington Capitals rebounded with a perfect week in the win-loss record in Week 9. It was not obtained easily, nor did it come without a price that, hopefully, will not exact too much of a toll in the days to come. 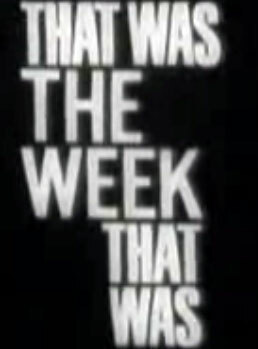 For the second time this season and first time since Week 4, the Capitals recorded a perfect week. Not that it was accompanied by any significant movement in the standings. The Caps finished Week 8 in fourth place in the Metropolitan Division, four points behind the New York Rangers with three games in hand, and sixth in the Eastern Conference. At the end of Week 9 they are in fifth place in the Metropolitan Division, trailing the New York Rangers, Pittsburgh Penguins, Columbus Blue Jackets, and Philadelphia Flyers, although the Caps have at least two games in hand on all except Columbus (both played 26 games so far). Not playing against a divisional opponent hurt the Caps’ chances to advance, but their 2-4-2 record against the division does not inspire a lot of confidence, either. They did face two Atlantic Division opponents (Buffalo twice, and Boston), and with the wins in all three games have a record of 7-1-1 against that division through Week 9. Balance and volume. That was certainly missing in Week 8, when Nicklas Backstrom recorded the only goal of the week. In Week 9, eight Caps shared in the 11 goals, and 13 skaters recorded points. Marcus Johansson had three goals and a pair of assists, one of the goals an overtime game-winner in the first game of the week, a 3-2 win over the Buffalo Sabres. One of his assists came on the overtime game-winning goal scored by Nicklas Backstrom in the Caps’ 4-3 win over the Boston Bruins in the middle game of the week. Evgeny Kuznetsov gave signs that he is coming out of the slump that he has been in for most of the season. He had four assists in the three games, posting at least one in each game of Week 9. It is the first time he had points in three consecutive games since he had single points (1-2-0) in Games 3-5 of the season back in October. There were a couple of noteworthy firsts for the Caps in the offensive end for the week. John Carlson scored his first goal of the season in the game to end the week against the Buffalo Sabres, ending a 26-game streak without a goal to open the season, and Jakub Vrana recorded his first NHL goal in the 4-1 win over the Sabres to end the week, the goal also being credited as the game-winner in that contest. Minimizing shots has been a hallmark of the Caps’ season thus far, but they have fallen off a bit in that regard in recent games. 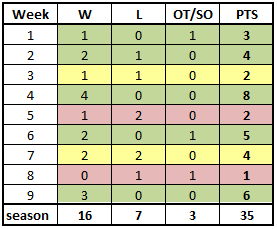 Only six times in 23 games over the first eight weeks did the Caps allow an opponent more than 30 shots. The sixth time was in tbe second and last game of Week 8. The Caps followed that up by allowing the Sabres and Bruins 33 and 34 shots, respectively, in the first two games of the week. That made it five times in six games that the Caps allowed an opponent more than 30 shots, and they averaged 33 shots allowed per game in that span. Washington got things under more control in the game to end the week, allowing the Sabres only 28 shots in their second meeting of Week 9, in Buffalo. The Caps had an iffy possession week. While they finished just under 50 percent Corsi-for at 5-on-5 (48.9 percent), it was a case of two good games (51.9 percent and 55.9 percent in the two games against Buffalo) against a poor game against Boston (41.2 percent). The price that the Caps paid for a good week in the defensive end was losing defenseman Matt Niskanen to an upper body injury when he was run into the end boards by Boston's Patrice Bergeron late in the first period of the Caps' 4-3 overtime win in the middle game of the week (Bergeron was assessed a penalty on the play). The game he missed against the Sabres to close Week 9 was the first game he missed as a Capital, snapping a streak of 107 games played. Niskanen is officially listed as "day-to-day," but no timetable has been offered for his return. The depth of the Capitals’ goaltending was on full display in Week 9. Braden Holtby won both of the games played to overtime, and Philipp Grubauer wrapped up the week with a solid win in Buffalo. The save percentages were solid across the periods for the week - .962 in the first period, .919 in the second period, and .935 in the third frame. Holtby stopped 60 of 64 shots for the week for a .938 save percentage, while Grubauer turned away 29 of 31 shots against the Sabres to finish at .935. That kind of consistency, especially in getting consistent and reliable relief from Grubauer, had been an important ingredient to the Caps’s success so far this season. Through nine weeks, Holtby has a save percentage of .923, and Grubauer is at .940. The Caps and the Chicago Blackhawks (with Corey Crawford and Scott Darling) are the only teams in the league with two goalies having played at least 250 minutes and with save percentages over .920. Grubauer is eighth in the league among goalies with at least 150 5-on-5 minutes in save percentage (.944), while Holtby is 11th (.941; numbers from Corsica.hockey). Three power play goals for the week ties the season high for power play goals in a week, and the 37.5 percent success rate is the best through nine weeks for the Caps. Not that the Caps were especially efficient in achieving this outcome. They had just nine shots on goal in 11:34 of total power play time. Six players had as many as two shots – Marcus Johansson, John Carlson, and Jakub Vrana. It might not be coincidence that these three players were the goal scorers for the week on the man advantage. The odd part of the outcome was the week for Alex Ovechkin. 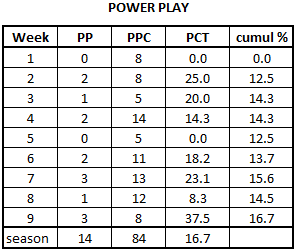 Despite playing 9:33 of the 11:34 of power play time for the week, Ovechkin managed only one power play shot on goal. 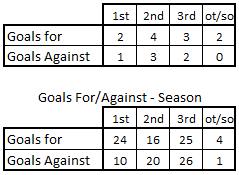 He has now gone seven games without a power play goal and, with just four power play goals on the season, is on a pace to finish with 13 man advantage goals, which would be the fewest he had in a regular season since he finished with 13 power play goals in 2011-2012, the last season he did not lead the league in power play goals (including the abbreviated 2012-2013 season, when he had 16 in 48 games). It might be important to keep in mind, too, that the Caps built their power play success this week on a team with a poor penalty killing record. They played the Buffalo Sabres twice, a team that came into the week with the 29th-ranked penalty kill in the league. The Caps were 3-for-6 against the Sabres, with eight shots on goal in 8:44 of power play ice time. Against the Boston Bruins, the third-ranked penalty kill when they took the ice against the Caps, Washington was 0-for-2 and had just one shot on goal in 2:50 of ice time. One area of concern in recent weeks has been the Caps’ propensity to take penalties and face shorthanded situations. The Caps appeared to begin addressing that problem in Week 8 with just five power plays allowed in two games. They permitted only three apiece to the Sabres and Bruins in the first two games of Week 9. And when the Caps allowed the Sabres only two power plays through 40 minutes in the third game of the week, it looked as if it would be another stingy week. However, Washington committed three minor penalties in the space of 8:37 of the third period while holding a 2-0 lead. It could have been a disaster. The Caps killed off the first two of the ensuing shorthanded situations, but they yielded a Kyle Okposo power play goal on the third to allow the Sabres back into the game. The five power plays the Caps allowed to the Sabres made it 11 for the week, and with them was a lot of shorthanded ice time recorded. But even with that, there was a certain efficiency in the penalty killing. Washington allowed opponents 14 shots on goal in 11 power plays covering 20:34 of ice time. Even the Okposo power play goal in the third of three straight Sabre power plays came with just 24 seconds left on the Buffalo man advantage. 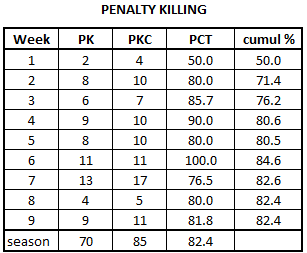 And there is another curious shot statistic coming out of the week in penalty killing. The Caps had five shorthanded shots on goal in 15:36 of shorthanded ice time against the Sabres for the week (Buffalo had ten shots on goal in that same span of time). A week that might be described as uninteresting in the circle was anything but. First, the 50.3 percent overall mark masks the fact that the Caps lost the offensive (47.2 percent) and defensive (48.1 percent) zones for the week. Then there was the usual (Jay Beagle finished with a 65.2 percent win mark) and the unusual (Evgeny Kuznetsov finished the week 51.2 percent to the good). And then there was the odd outcome in the second game against the Sabres to close the week. Perhaps it was a specific attempt to protect a player, and perhaps it was just circumstance, but Beagle took 20 draws against the Sabres overall (going an amazing 16-for-20). Of those 20 faceoffs, 15 were taken in the defensive zone (he won 13). On the other hand, Kuznetsov took 12 total draws in that game but none of them in the defensive zone. Beagle and Kuznetsov were the only Caps taking at least ten faceoffs for the week to win more than half of them. The Caps won the week in every period, including overtime, in which they scored two game-winners. This is a hopeful sign in two respects, both with respect to goals allowed. First, the Caps allowed just one first period goal for the week. With it, the Caps became the last team in the league to allow a tenth first period goal this season, and they finished the week with the fewest such goals in the league. Second, the Caps allowed just two third period goals. That does not sound quite as impressive, but the Caps have been a middle-of-the-road performer in this regard for much of the season. A third period power play goal allowed to Boston did cost the Caps a victory in regulation time (they won in overtime), and they did allow 31 shots on goal in the third period over the three games, but their third period performance did evidence a bit of a tightening up. A 3-0-0 week is not to be sneered at, but neither should it be revered as a return to dominance by the Caps. Twice they beat a young, struggling team, and they took advantage of a goalie against whom they have had unusual success (Boston’s Tuukka Rask gave up four goals on 20 shots and finished the week with a record against the Caps of 1-8-5, 3.00, .894, with one shutout). On the other hand, one could say the Caps ground out six very important standings points, given that the teams ahead of them in the Metropolitan Division standings went a combined 11-1-0 for the week. The 3-0-0 record meant only that the Caps were able to tread water in the standings, but they do have at least two games in hand on three of the four teams ahead of them (Columbus has played in the same number of games – 26). The trick is to make those games in hand count, and with a four-game week coming up in Week 10 (including a back-to-back to close it), that is the next task on the to-do list.